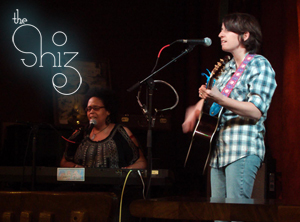 The burgeoning band is the indie rock alter-ego for conscious, retro, folk-rock and soul duo, Liz Hogan and Lilli Lewis. Hogan and Lewis first joined forces in 2004, debuting at Atlanta's Music Midtown Festival. Their collaborations cross genres from jazz and soul to folk and rock, always delivering with compelling transparency, honest songs from the heart and soul of the south. In 2013 the band climbed to Reverbnation's Top 10 New Orleans Rock Charts, was a regional finalist in the Hard Rock Cafe's Hard Rock Rising Global Battle of the Bands, and was a "Next Big Thing" feature on AfterEllen.com. Furthermore, as the only woman fronted indie-retro-rock band on the scene, Hogan & Lewis have been deemed the "First Ladies of New Orleans Roots Rock & Soul." “Where We Stand," the band’s first full length recording, was released in 2009 and is available on iTunes and at CDBaby.com. The latest EP, “I AM” is available at noisetrade.com/iamtheshiz. They are currently working on a new studio album for release in the Summer 2013. ""There are some bands that make you want to put your hands in the air, shout hallelujah and shake your booty for the rest of the night. With a swampy groove straight out of New Orleans, The Shiz does just that...With an Alabama Shakes intensity, they deliver a solid collection of music that wails with guitar, come-to-Jesus organ, bass, drums and more. The harmonies are so rich you could eat them with a spoon. They’ve got a great vibe and the lead singer has enough energy to power a large city. " - Jamie Anderson, indie-music.com (Jun 03, 2013)"
"It literally blew me away. They played original songs that had meaning. Their music was crisp and clear, and the lyrics were pure gold. These ladies are here to stay and somewhere down the line everyone will know who The Shiz is." "Think Joan Armatrading meets Bob Dylan meets Lucinda Williams meets Tracy Chapman. I adore you guys..."
"Lilli Lewis is the most slept on black folk singer. I listen to her when I want to be high on my soul." "...innovative, soulful music that will never go out of style."